The Cleveland Cavaliers have announced that Uber is now the Official Ride of the team –– a new partnership that will provide more game travel options to Cavs fans headed to downtown Cleveland at Quicken Loans Arena this season. As part of the new partnership, there will be a dedicated Uber Pickup Zone in front of Tower City Center on Huron Road. In addition to Cavs games, the new Uber Pickup Zone can be utilized by fans attending all events held at Quicken Loans Arena, including Cleveland Monsters games, Cleveland Gladiators games, family shows, concerts, and other special events. 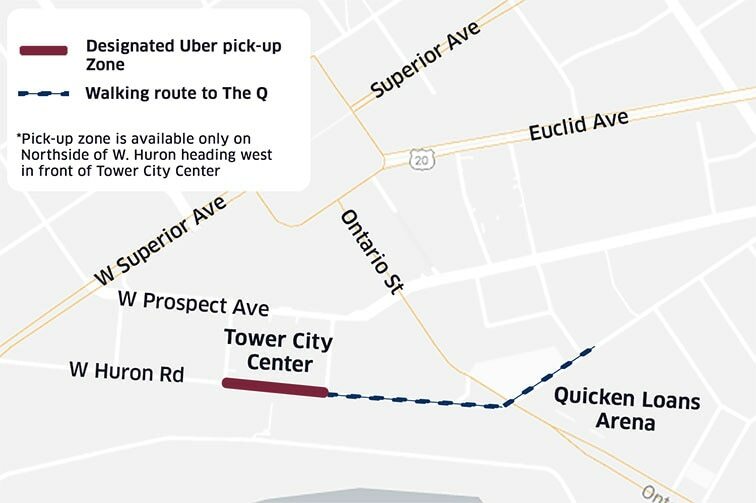 Fans arriving to The Q using Uber will experience the same convenient service with drop off at any entrance to the arena. After Cavs games and other events, Uber requests will be directed to the new dedicated Uber Pickup Zone. This will allow for a safe and more efficient experience finding a ride at the conclusion of an event. Exit the arena to Huron Rd., walk west towards W. Huron Rd. (cross Ontario St.), continue on W. Huron Rd. to Tower City Center. Continue toward the dedicated Uber Pickup Zone on Huron Rd. in front of Tower City Center. Fans also have the option to take the covered RTA Walkway located inside Quicken Loans Arena to Tower City. Proceed to street level on W. Huron Rd. The RTA Walkway is open four hours before and three hours after an event at The Q. The partnership will also include special in-arena perks for fans and exclusive promotions via the mobile app throughout the season. Cavs fans new to Uber can receive $15 off their first ride with promo code CAVS17. Uber’s mission is to make transportation as reliable as running water – everywhere, for everyone. We started in 2010 to solve a simple problem: how do you get a ride at the touch of a button? Six years and over a billion trips later, we’ve started tackling an even greater challenge: reducing congestion and pollution in our cities by getting more people into fewer cars.